Dr Sally Marlow listens to the 'Who Cares? What's the Point?' podcast from psychologist Dr Sarb Johal. Who Cares? 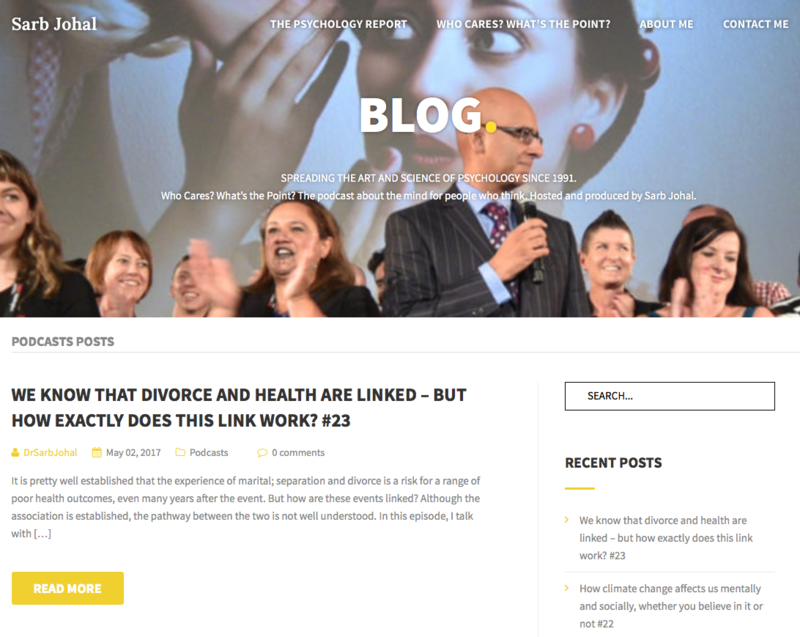 What’s the Point?, is a podcast hosted by Dr Sarb Johal, a UK-trained Clinical Psychologist and Health Psychologist based in New Zealand, billing itself as ‘the podcast about the mind for people who think’. I listened to two episodes in which Dr Johal interviews people carrying out research, and at the end asks them who cares, and what's the point. In Sleep paralysis, more common than you might think he interviews Dr Brian Sharpless, Associate Professor of the American School of Professional Psychology at Argosy University, Northern Virginia. I’ve been interested in sleep paralysis since first hearing about it in an Anomalistic Psychology module on my BSc Psychology at Goldsmiths. And who knew the iconic painting The Nightmare, by Henry Fuseli, in which a demonic incubus sits on the chest of a sleeping woman, takes its name from what the word ‘Nightmare’ used to mean before it was hijacked as a label for a bad dream. Sharpless is an engaging interviewee, clearly fascinated by sleep paralysis, and one a mission to explain to the world what it is, and, crucially for the title of this podcast series, who should care. The second episode also resonated with me, particularly as for the last three months I have been spending a lot of time away from my usual base in the centre of London, travelling to a remote bit of rural North Yorkshire. As I listened to Mapping the Link between biodiversity and wellbeing - Naturebuzz, I was looking out over a beautiful green space with rabbits jumping about in the distance, and bees buzzing past my window. Laurie Parma, from the Department of Psychology at the University of Cambridge, tells Johal that green space makes you feel better, calmer, less stressed and even happier. Nothing new in that, you might think, and you’d be right. But the project Naturebuzz is going further – it’s a citizen science initiative, and you can sign up to an app which alerts you to feed in data about how green your surroundings are at any given time, and details about your wellbeing. After a few weeks you can prompt a map which shows you with red and green lights where you feel happiest… and meanwhile Parma and her team are analysing your data with the aim of informing future policy on green spaces. Her mission is to ‘flip’ how society thinks about green space – not in terms of economics or guilt-ridden consumption, rather as a key component in maximising wellbeing. Even from my small sample size of one, I can confirm the assertions of the interviewee – in North Yorkshire I feel less stressed, and more at peace than in London. Who wouldn’t with a view like this….